A Break in the Weather…and Fishing is Good! Whew! Glad we are out of the deep freeze. Too early to be in the 20s and 30s! Some rain the past two days, but temperatures in the 50s and 60s make that tolerable. Looks like normal temperatures through the Thanksgiving week…..upper 40s and 50s. Yeah! Generation has been all over the board, but generally we have seen good wading water sometime during each day. Let’s hope that’s what we see for the coming week. Gina on the water Thursday with Denton and Gail from Florida who are moving back to Missouri. Gina put Denton in the water with a sinking leader and a holographic crackleback and he spent the morning catching fish. 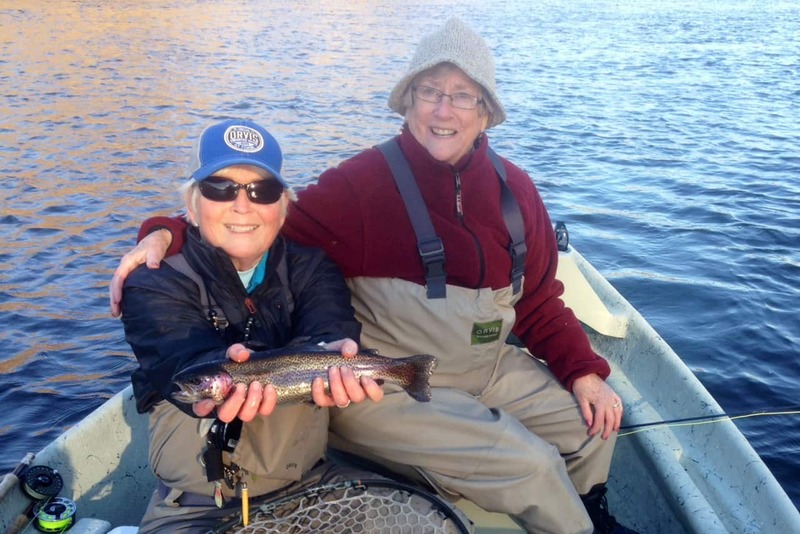 Gail got a quick refresher course and then focused on catching her first trout on a fly rod. Mission accomplished! Wonderful day on the water. Welcome back home to Missouri Gail and Denton! Saturday, Stan took Bret from Texas out for the morning. Bret wanted to work on streamer fishing, so Stan set him up with the sinking leader and a holographic green crackleback. Several hits, misses and a few fish. Lots of fish on the black midge with the copper dun midge dropper. Winter fly tying schedule has been posted. Getting that time of the year to start thinking about tying up flies on those cold, snowy, windy days! This entry was posted on Sunday, November 23rd, 2014 at 10:23 am	and is filed under Fishing Reports. You can follow any responses to this entry through the RSS 2.0 feed. You can leave a response, or trackback from your own site.